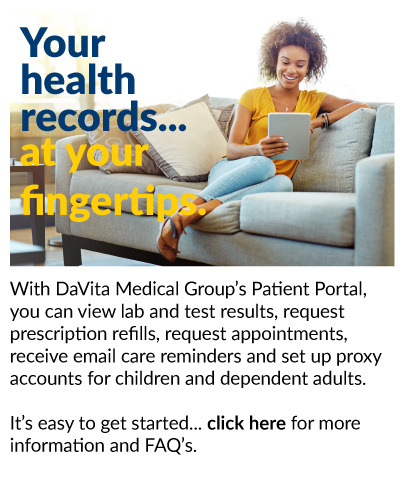 Why Choose DaVita Medical Group? Searching for top Colorado Springs Doctors? The DaVita Medical Group surrounds you with a team of medical professionals whether you need urgent care, pharmacy, sleep help, an MRI, outpatient surgery, or support for your diabetes or weight management health conditions. In addition to primary care, we are proud to provide Allergy and Immunology, Bariatrics, Cardiology, Dermatology, ENT (Otolaryngology), General Surgery, Hematology and Oncology, Hospital Medicine, Neurology, Ophthalmology, Orthopedics, Podiatry, Pulmonology, Radiology, Sleep Medicine, and Urology.